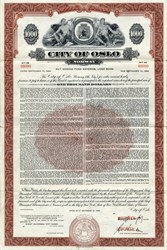 Beautiful specimen $1000 Bond Certificate from the City of Oslo. This historic document was printed by the American Bank Note Company and has an ornate border around it with a vignette of allegorical figures and a coat of arms. This item has the printed signatures of the Mayor, and Chief Municipal Administrator, and is over 49 years old. Oslo is the capital of and most populous city in Norway. Founded around 1048 by King Harald III, the city was elevated to a bishopric in 1070 and a capital under Haakon V around 1300. Personal unions with Denmark from 1397 to 1523 and again from 1536 to 1814 and with Sweden from 1814 to 1905 reduced its influence. After being destroyed by a fire in 1624, the city was moved closer to Akershus Castle during the reign of King Christian IV and renamed Christiania in his honour. It was established as a municipality (formannskapsdistrikt) on 1 January 1838. Following a spelling reform, it was known as Kristiania from 1877 to 1925, when its original Norwegian name was restored. Oslo is the economic and governmental centre of Norway. The city is also a hub of Norwegian trade, banking, industry and shipping. It is an important centre for maritime industries and maritime trade in Europe. The city is home to many companies within the maritime sector, some of which are amongst the world's largest shipping companies, shipbrokers and maritime insurance brokers. Oslo is a pilot city of the Council of Europe and the European Commission intercultural cities programme.